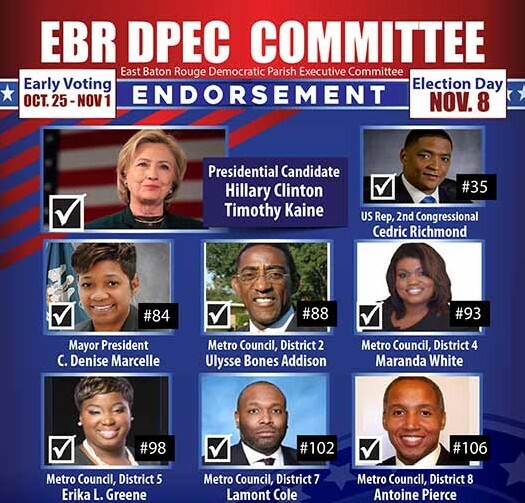 The East Baton Rouge Democratic Parish Executive Committee has issued its official endorsements for the Nov. 8 election, and there are surprises. The committee voted to endorse Rep. C. Denise Marcelle for Mayor-President over former Sen. Sharon Weston-Broome, who had been considered a favorite to make the runoff. However, Marcelle was much more visible during recent protests after the shooting of Alton Sterling. She was one of a group of African American leaders who worked hard to keep things peaceable. 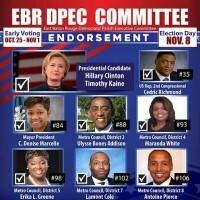 The endorsement could provide a boost for Marcelle. Other surprises were the endorsement of two former Metro Council members who are challenging two sitting Metro Council members. Former Metro Councilman Ulysses (Bones) Addison was endorsed over current Councilwoman Chauna Banks in District 2. Addison represented the district for 12 years from 2000 to 2012, when he was term-limited. Burgess over current Councilwoman Tara Wicker. Burgess represented the district from 1996 to 2008. Addison was considered a fiscal conservative when he served on the Council. Wicker is a pastor and generally makes decisions based more on her Christian principles than based on party. The Metro Council is not generally a partisan battleground. In fact, party affiliation has seldom been a factor in major issues before the Council. In recent years, Metro Council districts 2, 5, 6, 7, and 10 have been solidly Democratic and the other seven districts have been solidly Republican.